His Holiness Dungse Shenphen Dawa Norbu Rinpoche, was a beloved Heart-Son of His Holiness Jigdrel Yeshe Dorje Rinpoche and Sangyum Rigdzin Wangmo, beloved husband of Sangyum Sonam Choskit and father of His Eminence Kathok Situ Rinpoche, Tulku Namgyal Dawa Rinpoche and two daughters Dechen and Tseyang. HHSDR was born February 17th, 1950 in Kongbu and was trained directly under his own father, His Holiness Dudjom Jigdral Yeshe Dorje Rinpoche. Dungse Shenphen Dawa Rinpoche later came to hold and serve the Terser lineage being installed as the head of the Tersar lineage by His Holiness Dudjom Rinpoche. His Holiness dedicated his entire life to the preservation and propagation of the Dudjom Tersar Lineage travelling and teaching extensively for more than 40 years throughout the world including Asia, Europe and the United States. Rinpoche unfailingly adhered to the traditional practices of the Nyingmapa and Dudjom Tersar tradition in particular while conveying all the levels of the teachings in clearly understandable modern applicable terms. Rinpoche inherited OCD in Greenville, NY at the time of the passing of his father and has developed the center into a thriving Buddhist heart center for all tersar students. Rinpoche conducted yearly retreats for over 35 years transmitting complete cycles related to the Buddha Dharma and the three roots , Lama, (Tsokyi Thugthig), Yidam (Vajrakilaya Putri Redpung and Namchak Putri) and Khandro, (Khandro Thugthig and Troma Nagmo as well as many other Tantras and terms of his father Dudjom Rinpoche. His Son, His Eminence Tulku Namgyal Dawa Rinpoche is now carrying on the responsibilities bestowed onto him by his late father HHSDR in general and to act as the spiritual head of Orgyen Cho Dzong and Yeshe Nyingpo Dharma centers in particular. Traditionally, namthars, autobiographies of a Tibetan Lama’s life, are written in hagiographical style. Since I am not a scholar of Tibetan literature, and since I am not a Tibetan, I feel to leave this notational work to someone more suited to or qualified to do the job. My job seems to be to translate not only the words our Vajrayana system is clothed in but moreover to interpret the understanding into western terms. It has been my experience that there is a fine balance between adhering to tradition and maintaining its forms, and assuring the teachings stay fresh, relevant and accessible in whatever terrain they find themselves in. If we throw away the forms completely, we trash several thousands of years of inheritance that was not only intended for us but for future generations as well. Similarly, if we allow the teachings to become the dead tradition of living people, rather than the living tradition of dead people, we will be the cowards who failed to breathe life into the lineage. And so, the following is my limited interpretation of some of the works, events, and sentiments surrounding the life of His Holiness from a fairly personal perspective. I am also completely certain that I am not qualified to address the levels of his attainment and so I will try to maintain my low altitude accordingly. His Holiness Shenphen Dawa Rinpoche was a very warm being. He was wise, knowledgeable, friendly, candid, and for me, accessible. He was a teacher, friend, brother, father, and executioner for thousands of people. At the same time, His Holiness was an incredibly private and shy person who made sure to keep his personal and his clerical responsibilities separated despite his accessible presence among us. For me personally, he was all those things and I would add, one of the closest people in my life although sometimes a disconcerting one. I say this because he never allowed my insincerity to get away with much of anything. He was often cryptic and as a Bhutanese, Tibetan, and Western cultural hybrid of sorts, seemed to pride himself in offering true and balanced reporting about our own plans within samsara and nirvana. This habit of his was, needless to say, ruffling. So much so in fact, that at times I had openly said to him: “I know there are many incarnations wrapped up inside you, Rinpoche. But today I need the one who more often answers positively to bless this activity that I am about to propose to you. I don’t want to hear from the naysayer ok? Can you manage that?” This is the level my stupidity and arrogance has been known to rise to. To some, Rinpoche appeared arrogant, like a Prince who just happened to be sitting in the right place when the throne became empty. But after knowing him for so long I can tell you with 100% conviction, that it was the exact opposite. That he was extremely humble and it was his pure devotion to the Buddha Dharma in general and his father, His Holiness Jigdral Yeshe Dorje Rinpoche in particular, that sometimes made him seem like a hardliner. As HHSDR was quite unassuming in his appearance, it was easy to overlook his highly evolved qualities which he held close to the chest. Each and everything he did in a relative sense was an act of respect and devotion to his father, His Holiness Dudjom Jigdral Yeshe Dorje and Guru Rinpoche himself. HHSDR never clung to anything that fell outside the sphere of HHSDR’s instructions and he meticulously held to all the requisites for perfect transmission of the Dudjom Tersar under his umbrella and wherever his influence spread. In his time, HHSDR was able to explain and demonstrate the need for students to understand that the Vajrayana’s underlying principles did not necessarily fall within the social norms of western values. He broke the news to us gradually and gracefully and humbly, without scandal, thereby maintaining an untarnished holding period of his responsibilities. But most importantly, I feel that HHSDR was really able to convey to his western students the means of practice from view, meditation, and action without ever allowing any of us to get away with inflation of our own egos and without allowing us to use the trappings to validate our own sense of self. Rinpoche told us that dying like a dog was his Dzogchen plan. That meant, in simple terms, less fanfare or display. But that is not at all what happened. Due to the constant rain of blessings from his passing, the entire forty nine days of Dorje Sempa ceremonies carried on seamlessly with tremendous signs for all who attended including for the longevity of the entire Dudjom Tersar lineage. I am not even referring to the miraculous display of the” THUG JAK CHEN SUM” Heart, Tongue and Eyes and other relics he left, but the host of less tangible lofty and practical blessings that rained down. His passing became a root cause for several hitherto unassembled groups of Dudjom Tersar to “regroup” as one family topped off by a most auspicious first USA visit from Yangsi Dudjom Pema Shepa Rinpoche from Tibet. For those who attended HHSDR’s passing and forty nine days, his movement into the Dharmakaya was clearly evident, deeply inspiring everyone. 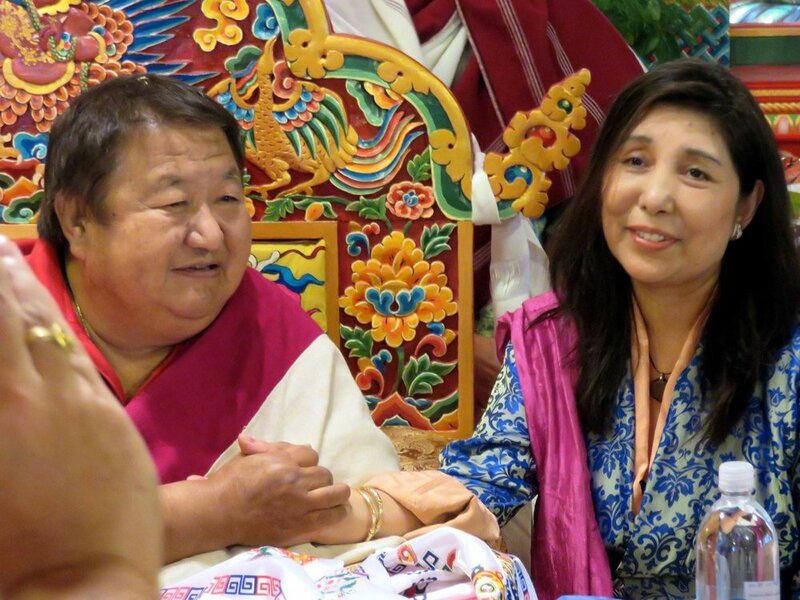 During a recent Tsok offering held at Yeshe Nyingpo in NYC, his son, Tulku Namgyal Dawa Rinpoche presided. At the end, a few students lingered and sat around Tulku Namgyal Rinpoche sharing jokes, views and love just as we used to with HHSDR. Upon returning to my home I had an auspicious dream and awoke in the middle of the night waking my wife with my burst of laughter from my dream state. Tulkula had hit my Dzogchen funny bone hard. I mused how ironic and hysterical it was that we were all praying so hard with knit brows for the swift return of HH SDR when in fact not only had he not gone anywhere else, but that he was in fact sitting right in front of us in the form of his son, H.E. 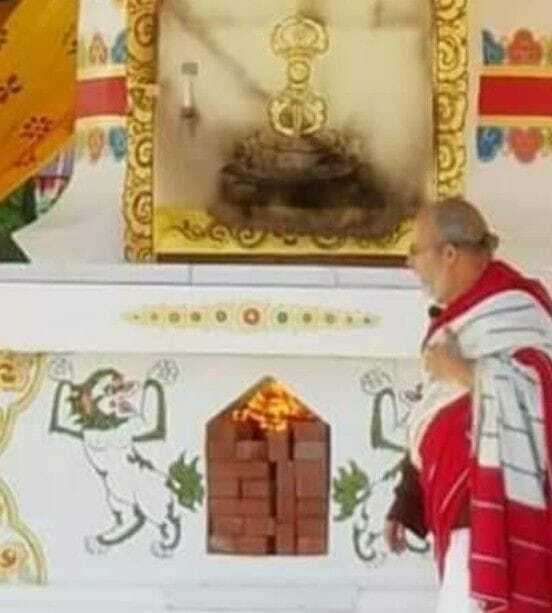 Tulku Namgyal Dawa Rinpoche, perhaps HHSDR’s most recent miraculous display? I cannot really say I ever felt totally comfortable with His Holiness SDR since he always kept me on edge. But I can say that the enrichment he has left in my life feels limitless and for all the unsurpassable treasures he so generously provided for me I am forever grateful and indebted. Also, although we experienced a great loss, how can we complain when he also left us Tulku Namgyal Dawa Rinpoche, a most perfect captain of a ship that has been sailing for millennia. Meanwhile, so that nothing is left out and since, when it comes to Buddhas, more is better, we adjourn with two prayers for the swift rebirth of His Holiness Dungse Shenphen Dawa Norbu Rinpoche so that we miserable suffering creatures of clinging and habit can see his “Benefiting Others Moon”-like face dawn again among us. In the realm of all-pervasive compassion, power of your intent never changes. Right now, by the Lama's kindness, the power of realizing awareness is brought up. The changeless original basis, arising as Kuntuzangpo's lineage. The sign of one's own and others' collective karma running out, there is impermanence. Disciple-children are oh, so bereaved! Depends on the Lama's previous Tugdam, and on purity of previous karma and aspiration. Who ships beings to full liberation! And appear as the honored guest in a single mandala for oneself and others born presently. So incited by excessive fascination with conventions of words and meanings, and by a special wish to alleviate my own and other Dharma brothers' and sisters' as well as beings' distress in general, may the stated intent of this prayer be rapidly auspicious, as marks and signs of swift accomplishment swiftly pervading underground, on earth and in the sky. Offered by the typical Konchok Tashi. Orgyen Chö Dzong, c. April 25, 2018.